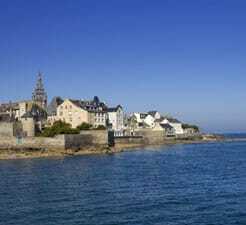 With our Ferry to Roscoff guide you will get all the info you need in order to plan your ferry crossing to France. Our comparison tool allows you to view Roscoff timetables and ferry prices on all possible routes removing the need to check numerous other websites. I was fortunate enough to travel on the Port Aven recently and found the whole experience an absolute treat. The weather was pretty foul approaching England but the Port Aven is a big ferry and took it in her stride. I have often wondered, considering how short the turnaround time is, how the staff aboard manage to clean up and make it look like the ship has been washed down from top to bottom, all in an hour or less! The food was excellent quality and variety. I dined on great food and can recommend the restaurants to anyone needing replenishment. Again, they manage to knock out a fabulous meal with so little time, it's truly impressive. I can honestly recommend travel on this ferry. It was a superb crossing in all respects, even though the channel was pretty rough with wave splash covering the windows on the 9th level. Impressive.